The ‘Coral Ruffles’ group come to us from modern day breeding programmes. 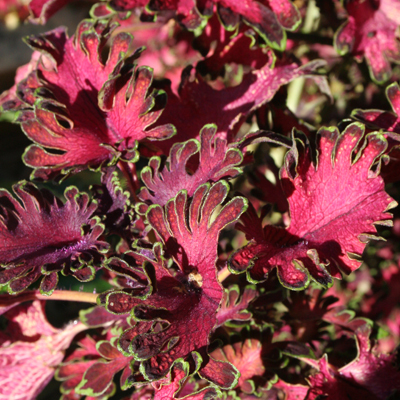 Fringed ruffled foliage, looking like coral make these plants desirable in any sunny garden. Vibrant foliage is a real asset to any mixed garden situation, with the ‘Coral Ruffles’ group providing dazzling mix of colours. Solenostemon with their beautiful highly variegated leaf forms have been deservedly popular and well known in gardens in warmer areas. Once established they need little extra watering. ‘Coral Ruffles’ can also be successfully grown in garden tubs and featured in high profile areas for special events. In potting use care so that the roots are not disturbed particularly if the plant is in full growth. Keep the plant growing strongly making sure it never dries out if in a pot as leaf drop will occur. Cut branches last well in floral arrangements. Solenostemon are among the easiest of all plants to grow. Once they are established in gardens in warmer areas where the temperature holds above frost levels they need little extra watering. In the warmer months the plants need to be well fertilised to maintain good growth as this accentuates the leaf size and colour. Whilst the plants are young, pinch the tips out occasionally to encourage bushiness. Remove any flowers and buds that develop as these detract from the highest colour in the foliage. Best colour will be attained in light shade in warmer areas but full sun will give best growth. Little trouble is experienced with pests but occasional mealy bugs and red spider mites may need controlling. Solenostemon are native to a wide area from Central Africa and right through into Indonesia. Most, if not all varieties sold are hybrids between several mixed species and existing hybrids. Some species such as Oregano are aromatic herbs.